Sometimes it happens that your family is out of Saudi Arabia on an exit re-entry visa and due to some circumstances, now they are not willing to come back or you don’t want to bring them back to Saudi Arabia. In this scenario, you need to issue their final exit visa to avoid any trouble in future. It means that the dependent fee will continue to be applied to you even when they are not in Saudi Arabia. So it is always better to complete the process of issuing final exit visa even if they don’t want to come back to Saudi Arabia from your home country. We have explained the procedure below. First of all, you need to download the form we have provided below. If you are not able to download it, you can still find it in front of the Jawazat. 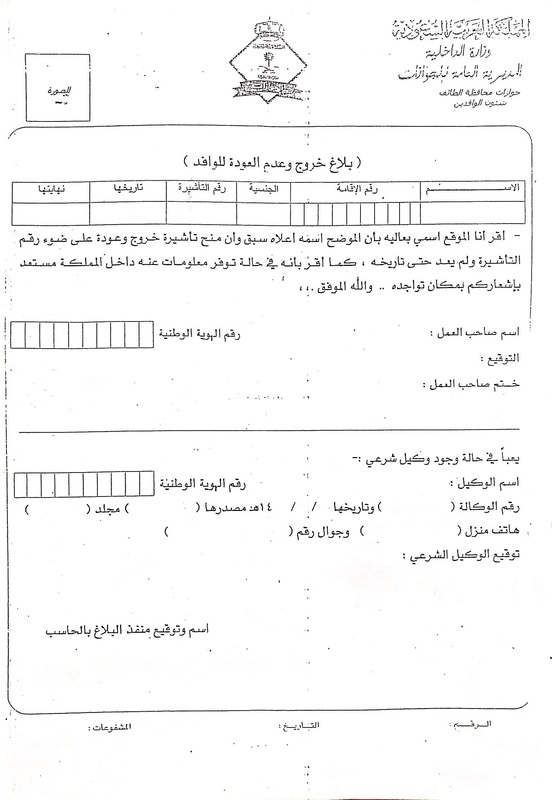 The form needs to be filled in the Arabic language. It is better to let some Arab fill it or pay SR 10 to an agent sitting in front of Jawazat office to fill it up. You need to go to any passport office (Jawazat) in any city and submit your family iqamas along with the duly filled form to the designated officer in one of the counters. You can ask anyone in Jawazat to determine the exact counter where you need to submit the form. Make sure that all the dues related to dependents have been paid including dependents fee. It should be noted that they will accept your iqamas after the 30 days of the expiry of the exit-reentry-visa of your dependents. Mazhar Ehsan: The exit-re-entry visa of my 3 dependents was about to expire on August 10 and I decided to cancel their residency permit (iqama) because of they settled in India and the ensuing hassles of their required visits to the Kingdom just to get another exit-re-entry visa if we had to keep their residency permit (iqama). Even though their iqama was valid up to next one year. I informed this to my company HR and they told me that the current rule of the Saudi government is to submit the iqamas immediately just the next working day after the expiry of the exit-re-entry visa. I visited the Jawazat in Taif accordingly, where I live currently and talked to the officer there. They informed me that the rule has changed and I can submit/surrender the iqamas only after the 30 days of the expiry of the exit-re-entry visa. He did not accept my iqamas. Incidentally, I had to go to India myself on a vacation trip on August 25 and I informed this to the officer. He told me it is ok if you are out of the Kingdom and you can come to Jawazat and submit the iqamas along with the related form after returning back to the Kingdom. I did accordingly. The status of your dependents in the MOI Absher system will be changed to “Left and Not Returned” from the earlier “Outside the kingdom” after you submit the dependents Iqama to the passport office. It means the visa is canceled and you will not have to pay any fee like dependent fee or fines. 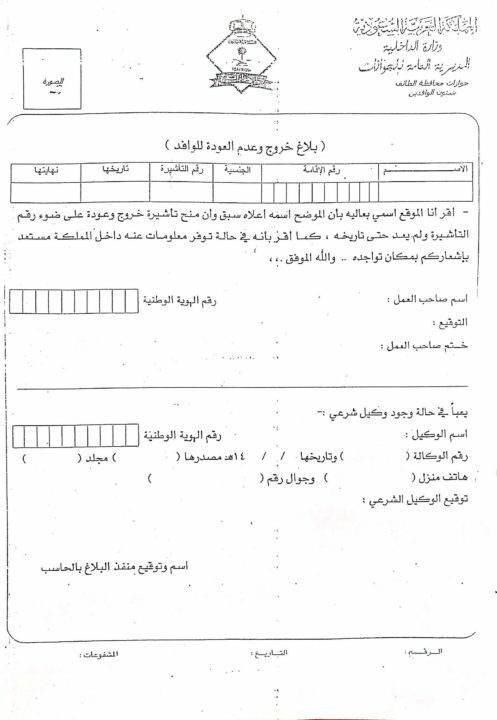 Addendum two: If the dependent who is away on exit-reentry visa had left before 1st July 2017 there is no dependent fee to be paid in that case, when you surrender their iqama to the Jawazat (Saudi passports office), to cancel their visa and residency along with the form attached with this article.